St Lawrence River, Massena NY September 7th. 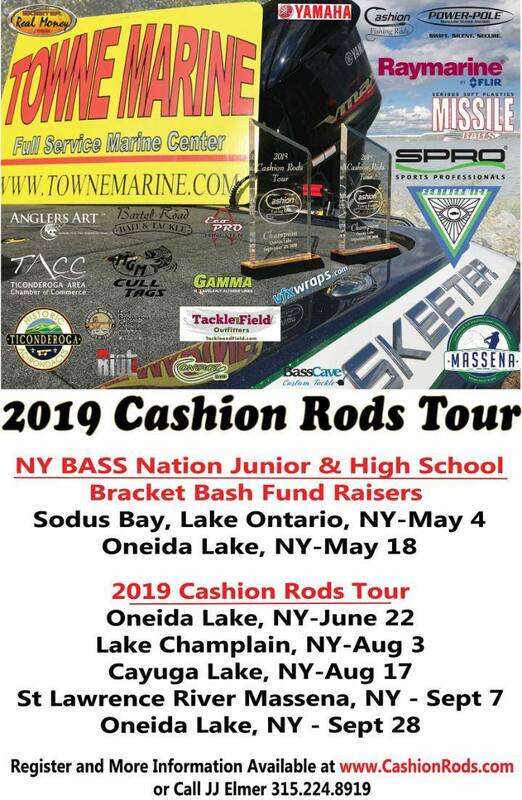 The team at Cashion Rods is extremely excited about this tournament. Please make sure your payment was processed to secure your entry. – Return your boat number key chain to the attendants in the anchored Starter Boat. Returning your key chain boat number to the attendant marks your official return time. Please make sure you are back by the designated time according to your flight. You will be penalized 1 lb. per minute and after 15 min late your team will be disqualified. – VERY IMPORTANT BIG BASS RULES! from winning any Tournament Prizes!If you wish to have a fish weighed for the Big Bass Prize, THE FISH MUST HAVE A CULLING PIN TO DISTINGUISH THE ONE YOU WISH TO WEIGH FOR THE BIG BASS PRIZE! This saves a lot of time. Pin the fish as you place it in the fish bag from your livewell. – Please hang around and hopefully you will be awarded the Cashion Rods Massena Open Champion Trophies!